Write an On-Line Battle Report and Get Sally 4th Pre-Printed Vehicle Cards for Free | H.A.W.K.S. 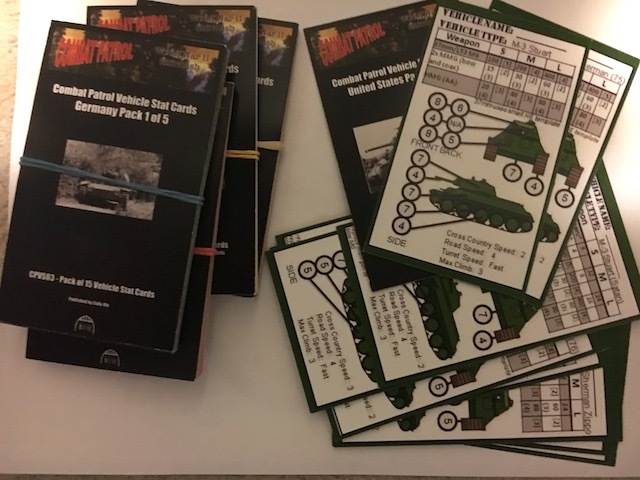 Sally 4th has produced these very nice vehicle cards that are already filled in with all the information you need to play Combat Patrol™: WWII. While it is easy to create these vehicle cards from the data tables and blank cards included with the rules, these cards make it easier to start playing a game — and they look great. They can be purchased directly from Sally 4th’s Web page. Sally 4th also recently started a new page on their Web site, called Front Line Reporting. This is space for battle reports of Combat Patrol games. If you post a battle report on some on-line forum and send us the link, either Chris Abbey or I will send you some of these cards for free as a thank you.